A stand of beautiful oak trees on Kyle Keegan’s Fool’s Farm. At long last, I have arrived at the final day of my introduction to qualitative field work in the Mattole watershed. Entering ‘Mattole’ in the search bar to the right will help you get caught up. The morning of Friday, August 19 did not begin like the others. This is because we had to pack! My cohorts and I cleaned up our campsite, loaded our belongings into our vans, and began the winding drive to Kyle Keegan’s Fool’s Farm. Kyle was waiting to greet us when we arrived. He was tall, perhaps in his upper 30s, and friendly. My cohorts and I gathered in a semi-circle for introductions, and then we each told Kyle about our prospective research questions. 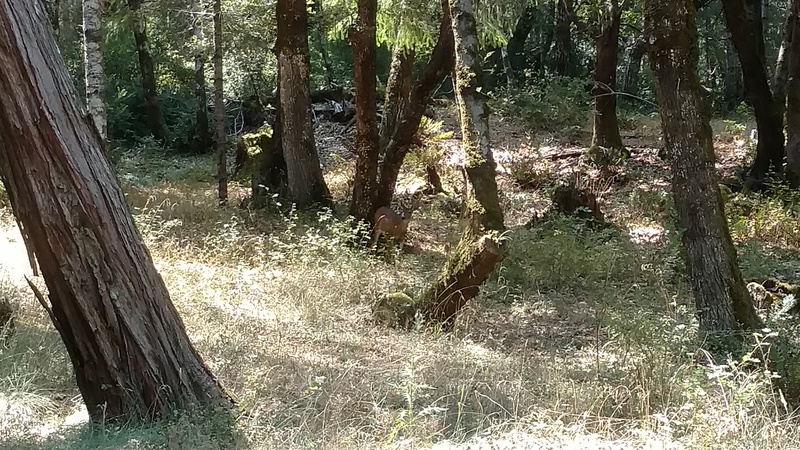 When it was my turn, I told him the question I described in Part 8: “How do people in the Mattole feel about tanoak trees?” I said this as confidently as I could, but truthfully I wanted to focus on mountain lions (Puma concolor). I would get my wish later. For now it was time to learn about Kyle. As we stood in his forested driveway, Kyle explained that he was a permaculturist. Based on my notes, permaculture is about, “mimicking natural designs in human systems.” It is “rooted in care for the Earth, people, and reinvesting in the community.” One of permaculture’s central principles is, “Don’t just do something, stand there and observe.” This means that one’s actions should be preceded by “prolonged and thoughtful observation.” This last element is key to sustainable living. By carefully observing his surroundings and performing controlled experiments, Kyle had achieved a remarkable symbiosis with the land. 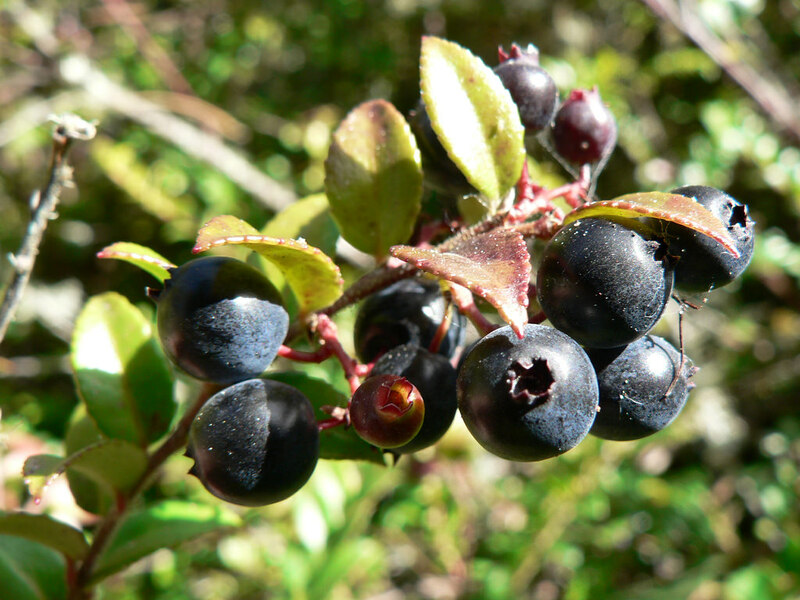 Through pruning and applying wood ash, for example, he had managed to turn wild huckleberry bushes into abundant crops. I can assure you they were delicious! After introductions, our group moved towards a small shed Kyle had built. The support beams for this structure had been kept in their natural, rounded shape. Kyle explained that circular logs are more flexible than square ones, and that small-diameter fir trees are plentiful in his area. Yet another example of working with nature. As we toured the Fool’s Farm, Kyle showed us more of his innovations. He had his shower rigged so that used water emptied into a garden behind his house; in which he grew food for his chickens. He had a toilet that composted human waste, a kiln for making biochar (which can be sold or used on site), and more. 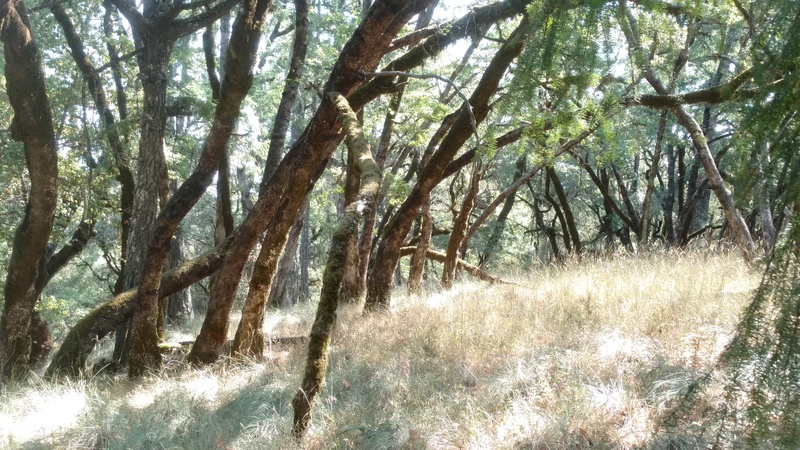 Eventually we came to a semi open area with several oak trees (see the featured image). 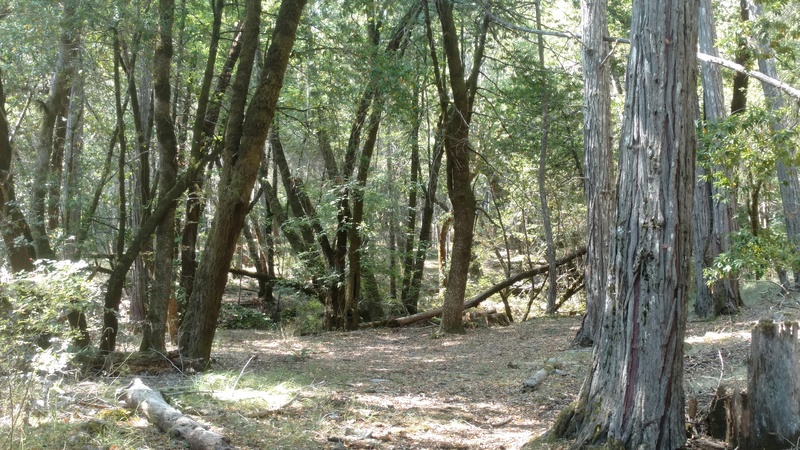 Kyle told us that oak woodlands have the highest terrestrial vertebrate diversity in California, and that Native Americans used to tend them with fire. He then showed us an oak tree that he had exposed to fire, which seemed to make it healthier. But in the spirit of “prolonged and thoughtful observation,” he was experimenting with this single tree before applying fire elsewhere. After more demonstrations in the oak woodlands, we waded through a field of tall grass to reach Kyle’s sun-drenched garden. Here he had fruit trees, many vegetables, and a greenhouse. We sat down for lunch under the welcome shade of a tent, which gave me a chance to speak with Kyle. Since he had initially studied wildlife biology, I told him about my interest in wild cats. During our discussion, Flora – whom you can read more about here – chimed in. She told me that if I was interested in learning about mountain lions in the Mattole, then she knew several people I could talk to. Kyle seconded this, which was a relief to me. I now felt justified in designing my mock research prospectus around mountain lions: which is what I did. 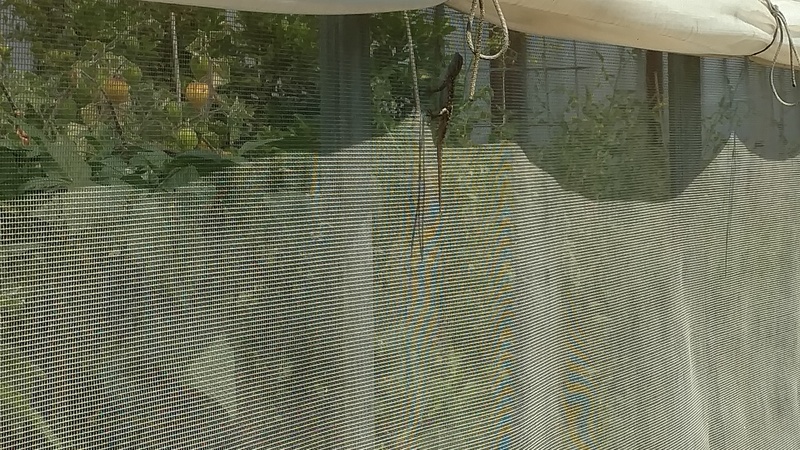 A small lizard on Kyle’s greenhouse. It is a wonder that I learned anything on this trip, since I was always looking at wildlife. After lunch, we explored more of Kyle’s garden. We then bade him a his wife fair well, and began the long drive home. What sorts of experiences are people in the Mattole having with mountain lions (Puma concolor)? Where are these experiences occurring? What sorts of beliefs do people in the Mattole hold about mountain lions (using an unspecified definition of ‘belief’ to see what respondents say)? This allowed me to develop a research prospectus that overlapped slightly with my emerging Master’s thesis. Then in November, my cohorts and I presented our prospectuses to some of the people we had met in the Mattole. This was sufficiently terrifying. However, Flora seemed to like my presentation. She urged me to carry out my proposed study for my final project, emphasizing that it would be both interesting and easy. But by then my mind was made up: I was going to Guyana. To complete this series, I leave you with some unused photos from the enchanting Fool’s Farm. 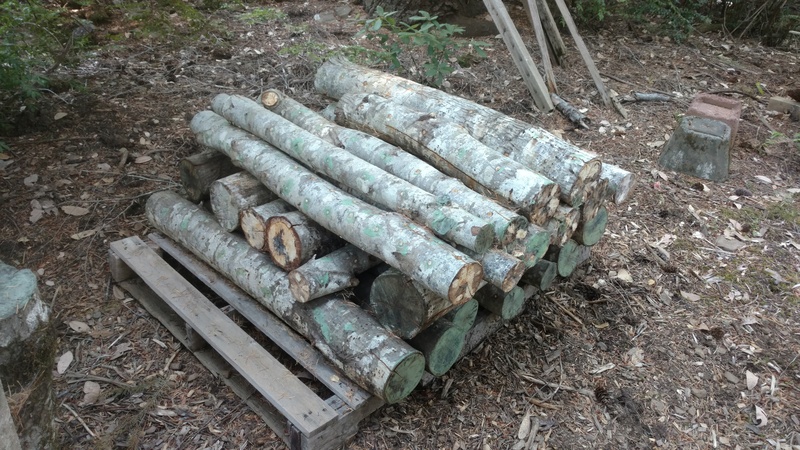 A pile of tanoak logs, which Kyle was using to experiment with growing fungi. I always feel at home in deciduous woodlands, having spent most of my life in them. On the way back from Kyle’s garden, we spotted some deer! I apologize for the poor image, but it is the best I could do. Thank you! It’ll make more sense if you read the other posts in the series .